Versazyme® is a laboratory tested and field proven protease enzyme that delivers optimum protein digestibility and feed cost management. 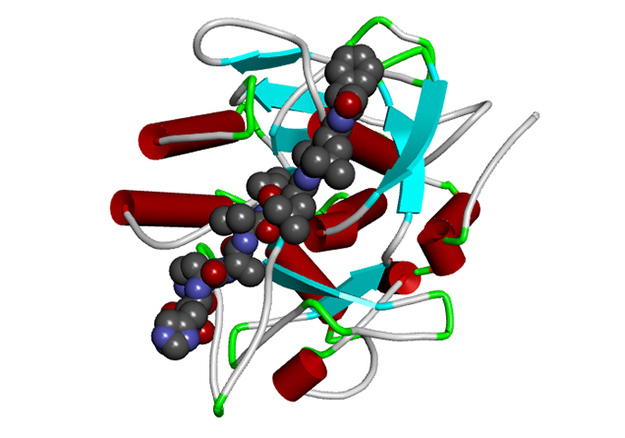 3D structure of Versazyme enzyme depicted in ribbon form with a short peptide molecule bound in the enzymes active site. Does my feed need to contain feather meal to get the full benefit of using Versazyme? Because Versazyme is based on a protease that works on a wide variety of animal and vegetable proteins, you will get all the cost-saving and environmental benefits of using Versazyme — even with a corn/soy diet that does not contain any feather meal in it. What is the application, inclusion rate, and stability of Versazyme? Versazyme is a dry powder that can be added pre-pelleting at a rate of 0.5 kg per metric ton (or 1 lb per U.S. ton) of feed. Dry Versazyme powder is stable at room temperature, resists pelleting conditions, and is heat-stable—even at high temperatures. How heat-stable is the Versazyme enzyme? Because the Versazyme enzyme is isolated from a naturally thermophilic bacteria that is able to grow at higher temperatures, Versazyme has an innate heat stability. BRI has performed multiple tests and pelleting trials to study the heat stability of the Versazyme enzyme and has found that Versazyme retains at least 80% of enzymatic activity at the high temperatures typical of the pelleting process. Is the Versazyme enzyme compatible with other enzymes? BRI has performed a number of trials to show that Versazyme is completely compatible with other animal feed enzymes, such as phytase and xylanases, which may already be a part of your animals’ nutritional regimen. Is the source organism for Versazyme genetically modified (GMO)? The Versazyme protease is an enzyme that is produced by a naturally-occurring soil bacterium known as Bacillus licheniformis. This bacterial strain is not genetically modified in any way. Where can I get a sample of Versazyme? Versazyme® is distributed worldwide by Novus International as Cibenza DP100.